Nathan is a graduate of the University of Utah (Ph.D) and Texas Christian University (MM), and for over a decade has taught hundreds of students across the country including college classes, academic seminars, and private lessons. 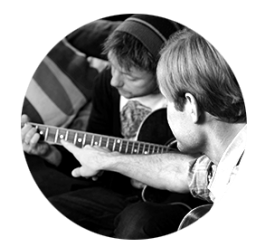 He offers a wide range of lessons including piano, guitar, songwriting, composition, as well as music theory and ear training. He is also very knowledgeable in both classical and popular music, teaching everything from Beethoven to the Beatles and more. WHY IS LEARNING MUSIC IMPORTANT? Music enriches nearly every facet of life! In this TED talk, Professor Anita Collins explains some of the long term positive effects of learning music. Convenient, in-home lessons start as low as $30 for 30 minutes! Please feel free to contact us with any questions, or if you're ready to start, enroll today! Current students, please visit the Student Resources page for a list of recommended books and music. For more information on pricing, view lesson policies. Lessons are structured around the student’s musical interests, whether it is classical, rock, jazz, etc. The goal is for the student to get the most out of their lessons while ensuring that their music education remains a positive experience. For younger students, parental involvement is key, just like any other subject in school. Students can begin as early as age 4, though guitar lessons at this age may require a 1/2 size guitar to accommodate growing hands. Piano for Percussion Prep – Many school band programs require up to 3 years of piano lessons in order to be accepted into the percussion section. This is because many percussion instruments such as the marimba have pitches laid out like piano keys. If your child is interested in percussion, piano lessons can be designed to emphasize pulse and rhythmic aspects of music, and even basic drum lessons to give them a head start. Students interested in writing their own music can always benefit from informed guidance about their music, from the beginner to professionals. The goal is to fine tune those skills that allow your individual voice to speak through your music. Because of his extensive experience as a composer of concert music and prolific songwriter since age 14 (not to mention exhaustive dissertation research into the construction of rock/pop music), Nathan can provide insight into your music few others can. 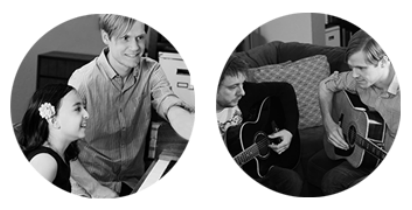 "Nathan is one of the best piano teachers my children have had, and they have been learning music with different teachers for 8 years now. He is both extremely knowledgeable, and incredibly respectful and patient with the kids. He has been a really good musical influence on my kids and I hope he continues working with them for many years to come." "Nathan is endlessly patient. I'm one of those people who get frustrated easily and he always keeps a calm voice and tries to make me laugh to ease my nerves of making mistakes. He is also very encouraging and knowledgeable about all music styles, techniques, etc." "I liked how Nathan taught me good ways to practice. He listened to what I wanted to learn and customized the lessons around that. Nathan is an extremely talented musician and great teacher. He's very professional and organized." At your house! Students (and especially their parents) love convenient in-home lessons. For parents, it means no sitting in traffic or waiting in a noisy lobby! For students, it means they are more comfortable, focused, and able to make the most of each lesson. I'm a complete beginner. How long will it take to be able to play a song on piano or guitar? This depends on many factors: age, practice time, style, dedication. On average, most students will be able to play a short and simple song within the first month or two. I not only teach my students how to play their instrument, but also how to practice their instrument, so learning new music becomes easier over time. Piano is the easiest to start but the hardest to master. Guitar requires a little more finger/hand strength at first to produce a consistent sound. Young students (4-7 years old) can learn guitar, but they are less likely to become discouraged if they start with piano first. Much of what they learn on piano (notes, rhythm, etc.) will carry over to guitar. All I have is a keyboard, can I still take lessons? Yes you can. Depending on the type of keyboard, it will be sufficient for the first few years, but eventually you will outgrow it. An acoustic piano has a different feel on the keys and pedals. It also has more presence and dynamic range (loud/soft) than most keyboards. A used upright piano can be found for far less than you might expect and adds a touch of warmth and class to any home. Feel free to contact me with any questions or advice on finding the right piano for you. Absolutely! This is actually preferred because you will know what we learned during the lesson and what they need to practice the rest of the week. Also, if children notice that music is valued in the house, they are more likely do very well. Cash or cards are accepted. Lessons are paid on a month to month basis. You can pay during the first lesson of each month, or set up a recurring payment through PayPal. More info on payment and billing can be found here.